What about the expression "eternal fire?" Sodom and Gomorrah, two ancient cities, filled with sin were consumed with fire from heaven. The Bible states that they were burned with an eternal fire (Jude 7). They are not burning today. These two cities are in ruins under the Dead Sea. According to 2 Pet. 2:6, they were turned into ashes. An eternal fire is one whose effects are eternal, one which totally consumes forever. Is Hell a hot spot burning in the center of the earth now? According to the Bible, the final destruction of the wicked comes at the end of time. The wicked are reserved unto judgment (2 Pet. 2:4). Our God is a consuming fire to sin wherever found (Heb. 12:29). 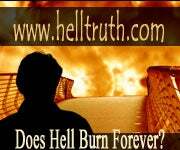 The fires of Hell originate from heaven at the end of time not some hot spot in the earth (Rev. 20:9). The wicked will be totally consumed. They shall be cut off from the earth (see Prov. 10:25, Ps. 37:10, 11, 20, 34, 38). They shall be consumed to ashes (Mal. 4:1, 3). This final destruction will occur after the thousand year millennium (Rev. 20:5) at the resurrection of damnation (Jn. 5:28, 29). Doesn't the Bible speak about the fire which cannot "be quenched" (2Mh. 9:43, 48)? The fire which cannot be quenched is one which no human hands can put out. It utterly, totally consumes. As a result of the Jews disobedience, Jerusalem was destroyed by Nebuchadnezzar in 586 B.C. The city was burned with an unquenchable fire. You may read the prophecy of this destruction in Jer. 17:27. "The fire consuming Jerusalem shall not be quenched." Yet Jerusalem is not burning today. The fire has done a complete work. What about the texts which declare the wicked will burn forever (like Rev. 20:10)? Forever in the Bible can be literally translated "until the end of the age" or as long as he shall live. The wicked are consumed, burned up, turned to ashes (Mal. 4:1, 3). The old age of sin and death ends. God ushers in a new age. (see Rev. 21:1-4). God creates a new heavens and new earth with no more crying, death, sickness or pain. In the Old Testament, a slave was to serve his master forever (Ex. 21:6). Hannah brought her son Samuel to the temple forever (1 Sam. 1:22). In both these instances the time period was as long as they lived. 1 Sam. 1:28 clearly states, "as long as he lives he shall be lent to the Lord." Jonah even uses the expression "forever" to describe his experience in the belly of the whale (see Jon. 2:6). Forever was a limited, not an unending time. It was as long as the Lord decreed, until the end of the age or as long as Jonah could live in that environment. The punishment of the wicked will be everlasting (Matt. 25:46). They will be consumed. Burned to ashes, they will be gone forever. It is not everlasting "punishing" or a continued state of torment. The idea of an eternally burning hell would make God a cosmic monster, delighting in destroying His creatures. A loving God must blot sin out of the universe or it will destroy the entire planet. Like a cancer surgeon, He must cut out the disease, however painful.